Lantana Movers – Moving is tough. That’s why movers can be expensive. At Discount South Florida Movers, we have the lowest rates around. Why pay extra for the same great service when you can save? Our professionals have been moving customers in South Florida area for over 15 years. Come check us out, we guarantee that you will be satisfied with your moving experience and your savings! There’s no part of your residential or commercial/office move that we can’t handle for you. We save you time and give you peace of mind that your belongings are packed securely, even pianos and other delicate items. Whether you are moving only a short distance or need your items shipped across the country, Discount South Florida Movers wants to help you. Lantana is a city in South Florida located within Palm Beach County. This city of 10,000 was first settled as part of the Armed Occupation Act of 1842 that was passed after the Seminole Wars. The town was developed by the M.B. Lyman family who opened several businesses in the town. In 1921 the city was settled as a one square mile town with 100 residents. Today the town was grown to 10,000 residents. It, along with many of its neighbors experienced tremendous population growth after the first world war. That development continues to this day as new rail lines and highways, especially 95 are extended into South Florida. That enabled the city to have the dubious distinction of being the home of the National Enquirer for decades. 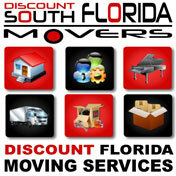 Discount South Florida and Lantana movers provide low rates on residential, commercial, piano and long distance moving.